It was 3 pm. I was on top of a mountain in the middle of the only green expanse in the cold desert in Kinnaur district of Himachal Pradesh. For the last 50 km I saw only mountains of stones and sand, and I would see only desert for the next 100 km or so. In between was this village full of trees. Lush greenery, herds of sheep feeding on clover and ponies carting compost offered a view far removed from what the name of the village evokes; Thang Karma means white open field in the Himachali language. A frail-looking man wearing a monkey cap emerged from a cave. Rubbing his eyes, he walked towards me; he had woken up from an afternoon nap. The meeting was unplanned. I had trekked across a mountain, crossed a river and then climbed another mountain to meet A D Negi. He has been living in the cave for over a decade. 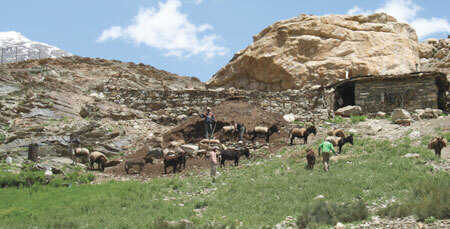 He looks after several cows, donkeys and a herd of 300 Tibetan goats. A retired bureaucrat, he lost faith in the government’s Desert Development Programme, for which he worked in the finance department. Negi, 63, has developed 90 hectares (ha) on top of a mountain. On 60 ha he has planted and nurtured 30,000 trees, cultivated kidney beans, peas and apples. On the remaining 30 ha, he grows clover of the leguminous pea family. People from villages as far as 50 km bring their sheep to Thang Karma, a village of just three people, after trekking for two hours from where the metalled road ends; the clover here is considered the best fodder. Orchard owners come in search of compost for their apple trees. Residents of Chango village, known to have the sweetest apples in the district, had come to buy compost made by Negi and his team of two volunteers. On the way, I came across several ponies carting sackfuls of vermicompost. A sack (50-60 kg) costs Rs 100. Despite the absence of cell phone signal, the internet, postal service and a track that leads to Thang Karma, Negi’s reputation for harvesting water in the desert and growing crops has travelled far. The flow of visitors has also increased. “Earlier, people from other villages would rarely trek all the way till here,” Negi said. Negi’s popularity was confirmed by a food stall owner in Nako, ; it was the only eating place in the 50-km stretch from Pooh, the town where Negi had a house. She told me Negi usually stopped to drink tea at her stall on his way home, and that he must be in Thang Karma. “Unsey toh sab registaan ke log kheti seekhna chahte hain (All desert people want to learn farming from him),” she said. “Bureaucrats and scientists from the Desert Development Programme never spent time here,” Negi said. Each time the Comptroller Auditor General of India asked why the project failed, they would say there is no technology to develop plantations on cold deserts, Negi told me. “It is only after I spent time experimenting with different kinds of plantations here, I have been able to develop this desert,” he added. The Central government programme was launched in 1977-78 to mitigate the adverse effects of desertification in cold and hot deserts. In 1999, Negi took it upon himself to develop the desert and implement the biggest and most prestigious cold-desert programme. He took leave of absence that year and in 2003 he took premature retirement to spend all his time in Thang Karma. Negi travelled across villages in the desert to learn traditional wisdom. “I am a farmer’s son, and I believe in traditional wisdom,” he told me. The approach he adopted included channeling streams from the glaciers, 25 km away, to irrigate the area. “Since the soil here has sandy loam, it is better that water flows quickly through the channels. So we made narrow channels and dug them on steeper inclines,” Negi said. “The government’s plans of concrete irrigation channels were bound to fail in such cold weather.” Negi also harvests water using the traditional system of zings, where channels end in a small pond where glacial melt is collected. These ponds raise the level of humidity in the air and keep groundwater recharged. Clovers are planted along the irrigation channels; they retain water and also divert hare that destroy crops. Hare love clover, so instead of attacking plantations they go for clover. The bark of tree saplings are covered with scrap wood to protect against the freezing cold. Saplings are planted a little below ground level in pits to shield them from the wind. Negi is now trying to plant conifers. Conifers serve as an excellent windbreak when they mature. Negi’s two volunteers have often tried to talk to him about chemical fertilisers and pesticides, but he would hear nothing of it. “Even the scientists who sometimes visit to see our work try to convince us that agriculture is not possible without chemical fertilisers but I feel compost is all my land needs,” he said. 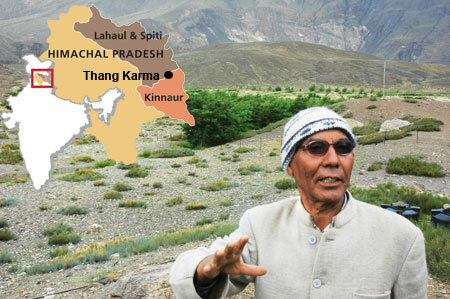 Negi envisions showcasing Thang Karma as a model to scientists so that they can replicate it in other regions. Residents of the sparsely-populated tribal region, who were earlier reluctant to take up farming, have applauded Negi’s approach and are following suit. After spending most of his savings in the desert, Negi is waiting for results. “The idea of the project was to know if it can be sustainable,” he said. Negi had planned the years from 1999 to 2009 as research period when he tried to grow whatever he could in the desert. After a decade of experimentation, he has found that only peas can be grown in a sustainable way in Thang Karma. “Pests, birds and cold waves spoil every other crop here,” he said. He wants to hand over the asset he has created to the government and work on more failed government projects. “We have created an asset worth almost Rs 4 crore, mostly from 30,000 trees valued at the government’s rate of Rs 1,000 a tree,” he said. If the government funds Negi’s work in another desert region he would go back to understanding nature and its ways. This is a brilliant story...you have talked about Thang Karma being away from any network connectivity but could you help me to get across to Mr Negi...is there a way to get connected to him till one could travel upto the hills? I am a development writer based in Delhi and am extremly impressed with the task that Mr Negi is doing and plans to do. A wonderful story. Makes me hope I can visit this man some day. Since I belong to the same district ,I have heard about Mr Negi and his efforts from my dad a lot and now when i read it here iam really happy that finally word is spreading out and may be he will get some grants for his future projects that he plans. But its a true exapmle of what a man can do if he has the will to do it. My heartfelt thanks to Ruhi Kandhari who has helped to get the work of Negi ji apppreciated world over if not by the state government for that matter. I belong to the same district of Himachal Pradesh and I am well acquainted with the climatic conditions which prevail in greater Himalaya region. Kinnaur is known as the cold desert and in this tough terrain Negi ji has given a invalueable contribution not just to mankind but to all living creatures. I wish good luck to him for his work and hope more people would recognize and appreciate his efforts. With such achievements; Negi deserves a medal. Not just from Himachal Pradesh or India. His achievement is beyond Himachal; His practice is applicable to arid place like Ladakh in J&K, Northeastern India, Baltistan in Pakistan, Afghanistan, Mongolia and Tibet. Desire, faith and action rules the world napoleon hill says!!!!!!!!!!!! thats what Mr Negi is doing hats off to" DESERT MAN"
Thanks to Ruhi for bringing this remarkable achievement to limelight. Shri ad negi has done where after years and years of effort by so called experts/scientists connected with Desert Development Programme after spending millions of rupees, there is nothing worthwhile to show on ground in the name of vegetating cold desert . Think of the fate of hundreds of hectares of poplar plantation raised under DDP by spending millions of rupees on planting and watering for year after year once these plantations were handed over to panchayats subsequently. All those plantations dried up.Firstly the choice of Poplar as a species for cold desert afforestation was wrong because Poplar is a mesophytic plant requiring adequate moisture for survival. Anyone could have seen that in nature these plants are localised along Kuhals(local irrigation channels). Having selected poplar, it was obvious that the plantations have to be provided watering through out its life which is not only cost prohibitive but ridiculous. And then handing over the plantions to panchayats for further maintenance without matching fund for regular watering was failure of policy and thereby millions going down the drain. Hats of to Shri AD Negi for using traditional knowledge and experience to prove that cold desert can be tamed.